On our last day in Napa, we had reservations to a very posh, very yummy looking Auberge du Soleil. After drooling over their menu every day and offering up half of my worldly possessions, I was ready to taste the legend. I called a few days before leaving for California and double-checked the reservation. I noted the time. And given how punctual each one of the girls is (including myself) there was no way we were going to be late for this lunch. Our wallets might have groaned, but our bellies were all anticipation. After the valet parking services took our car, we proceeded towards the restaurant. There, the hostess rudely told us we had missed our reservation, that it was for an earlier time. I, very politely, tried to insist that our reservation was for the time we arrived. The hostess, a tall, tan, athletic woman in her forties, vaguely resembling Suze Orman, glared at us. Even if we were irresponsible and screwed up the reservation, this was no way to speak to customers. We politely excused ourselves and left. Lunchess and a bit deflated, we decided upon going to a nearby little grocery store, stocked with yummy gourmet food, and indulge in a picnic fit for kings. 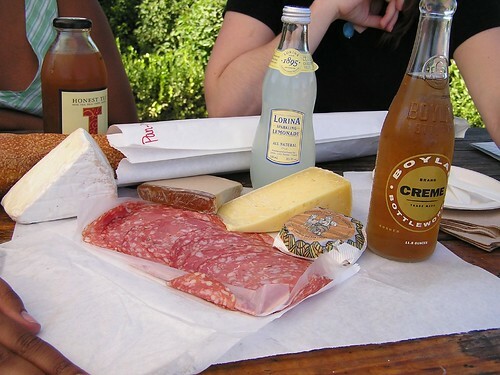 We bought three different kinds of cheeses, made locally in Napa as well as Hudson Valley of New York: a sheep’s camembert, a goat cheese, and a hard, cow-milk cheese; soppresata, perfectly cured; duck liver pate, decadently rich; a freshly-baked baguette, and some yummy beverages. We sat outside, savoring our makeshift lunch, admiring the acres of grape vines all around us. We agreed that this picnic was far superior to any gourmet lunch we could have had and how great it was that everything turned out this way. Having been given lemons, we made lemonade. And I dare say it was better than the feast we were promised. Yikes! The image of Suze Orman’s doppelganger hissing at me like that gave me shivers! What a horrible way to treat your potential guests! I’d say you not only made lemonade, you made mojitos.